If you have work and personal accounts on the same cloud or IM services, now you can add and access all of them in WinZip. You no longer need to log in and out depending on which accounts you want to use. Add up to 16 accounts, give them unique names to distinguish them and enjoy easy access to your files for any of the many services supported by WinZip 21. Sometimes you want to access just one file in a large, multi-file Zip. With WinZip 21, you have the flexibility to move selected files to individual zip files with optional encryption. That means you no longer need to download an entire Zip when using your phone to access files in the cloud, you can simply download the individual zip file that you need. Easily expand or revert the Files Pane just by swiping. 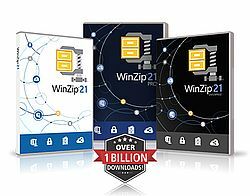 WinZip® 21 Pro delivers renowned compression and encryption, essential backup tools and new productivity-boosting features. Now you can access files more easily by adding multiple accounts from the same cloud or IM service to WinZip. Sharing is also easier with all your contacts in the new Combined Address Book. File handling is more flexible than ever, giving you more control over how you zip, encrypt and share individual and groups of files. And enhanced MP3 compression reduces files by 15 – 20%. Browse and edit files on your PC, network and clouds, plus resize images, create PDFs, add watermarks, scan and share documents and much more with the power of WinZip 21 Pro. Along with the proven compression, encryption, sharing and backup in WinZip 21 Pro, this special version includes support for SharePoint and Amazon S3. This allows your business to offer employees easy, secure sharing across email, SharePoint, Amazon S3, Office 365 for Business, and IT-enabled clouds, social media sites and instant messaging services, all from one application. 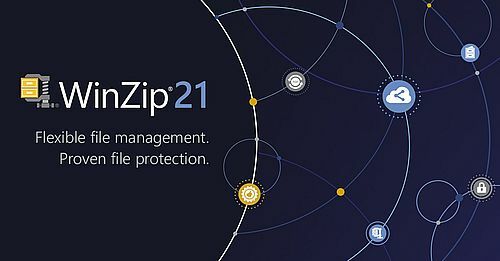 WinZip 21 also ensures your business meets U.S. government requirements for FIPS 140-2 encryption, both at rest and during exchange.